Z Score Cut off marks for the 2015/2016 university academic year released Today. The cut off marks are based on the 2015 GCE Advanced Level results. The new academic year is scheduled to start in November this year and UGC hopes to admit 27,000 students. Students can also obtain Z-Score via Dial 1919 Hot Line. The Z Score Cut off marks for the 2014/2015 university academic year released (October 5). The cut off marks are based on the 2014 GCE Advanced Level results. The new academic year is scheduled to start in November this year and UGC hopes to admit 25,000 students. “Lanka University News” published the z score pdf files before other medias. 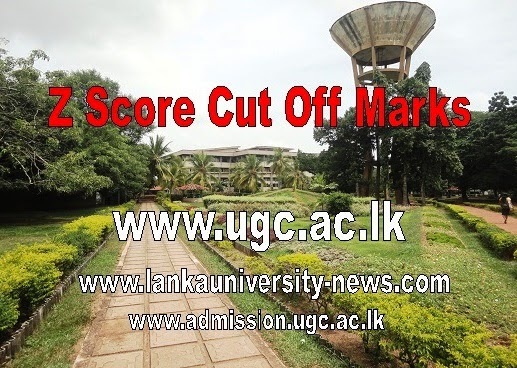 Sri Lanka University Grants Commission UGC released Z score cut-off marks for the university admissions based on the GCE A-Level 2013. Here is the z score pdf files. hey oyalata post card eka awada? I've been selected for food prod tec management. Y will have received with ur university entrance letter formally. But u can guest it according to demand for each universities for each courses. But please aware about order. Ekata ithn admission lettr eka enaknma inna ona.. habai art(sab) select aya nm dannwa eyala aniwa sbaragmu uni.select kyla.. mkda eka sbaragmu wtharai thyenne..
Mchnla has anyone hv any idia on design dig @ moratuwa?? i got information systems in ucsc. any 1 got thz cours plz contuct me. i am sifan. are there anyone who selected to the siddha medicine from kandy district??? Kurunegale distric ake menagment slct aya kawru harita p.crd awanag keyanna plzzzz. Mage yaluwek innawa eyath industrial informat.tech. I also got selected to IS ..wats ur Z score? I also got IS.oya kohenda frend? In the handbook released recently z score given are based on 2013 exam. or should i wait until the release of new z scores based on 2014 exam? when will z score based on 2014 A/L be released? yaluwane 2014\2015 z score cut off marcks dala nadda? agnidiga university patan ganne kawadada.... mta physical science awe. danna kawru hri kiynwada..
kalani,ruhuna 8 ptn gnnwa.thama oyta letter awe ne kyne thawa late wei.ntnm me sati deke letter 1k ewi. mage z core eka 1.5204 stream eka commers. iland rank eka 3568 mama managament walata ahu weidha? Mona camps ekata yanna weidha? Me year eke kegallen management walata kiyak select weladha dhanna kenek kiyannakooo....! Software engineering wlt z score 1 kyk oneda..?